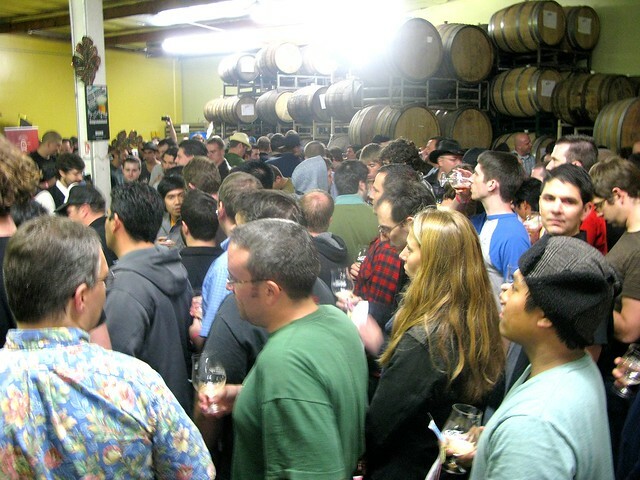 Thirsty throngs at the Bruery's Black Tuesday. This past week I was lucky enough to get the chance to attend two popular events: the 2nd Annual Taste of Abbot Kinney this past Sunday and last night’s Black Tuesday release party at the Bruery in Placentia. Both events anticipated huge crowds but handled them very differently; one successfully and the other dismally. Oddly enough, one learned from its past mistakes and threw a better, more organized affair while the other, well, did not. Yes, The Bruery’s Black Tuesday event was the winner in this case. Apparently its Black Tuesday event last year was such a chaotic mess with tons of unhappy, thirsty people that they decided to do things very differently this time around. Breaking the event up into two sessions and including tasting tickets to the event with the purchase of a bottle of Black Tuesday. People who were able to get tickets to the event were able to purchase more bottles afterward. And whatever stock remained was put up for sale on The Bruery Provisions Web site, which promptly sold out much to the chagrin of beer lovers everywhere. Although, if you have the cash for it, you can probably get a bottle on eBay. The event did still have huge throngs of people crushing the bar in the brewery but somehow the three or four beertenders buzzing from tap to tap were able to keep the lines moving quickly so that no one was kept waiting for too long. I hate lines and even I didn’t mind them. By the way, the Black Tuesday beer was so tasty that I had to buy two bottles. I also highly recommend the Premiere Belgian Golden Strong ale which can only be purchased at the Provisions store in Orange. I loved the fact that with admission we* were given a clutch of tickets, a menu of everything on tap (including phone numbers to local taxi companies) and a tasting glass. I tasted everything I wanted to and even had a ticket left over. By the time last call rolled around a half hour to the end of the event, people were shrugging off their extra tickets. It’s always better to have extra than not enough. For food offerings there was only the Lime Truck food truck outside the venue as well as a tasty selection of cheeses and Mignon chocolates to pair with the beers, but I was still satisfied. 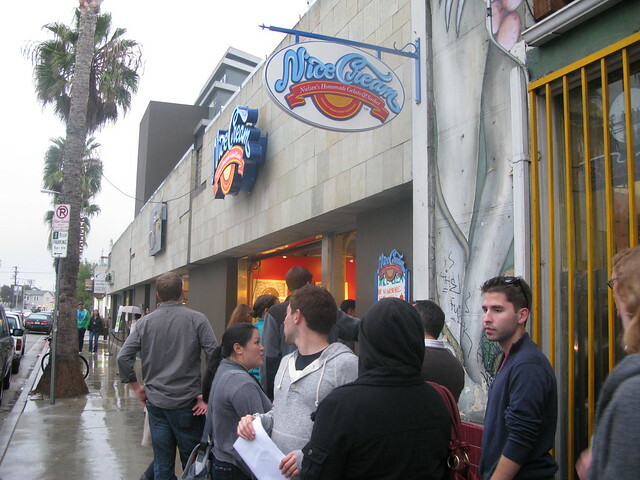 Long lines for N'Ice Cream at Taste of Abbot Kinney. Unfortunately the same couldn’t be said of the 2nd Annual Taste of Abbot Kinney, a fundraising event for Inside Outside Community Arts, that I loved attending last year but was really peeved by this year. 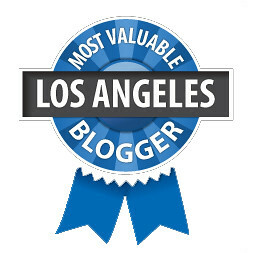 Since I was just coming back from Los Angeles Magazine‘s Food Event in Malibu (more on this later), I arrived in Venice a little bit before 5pm, the halfway mark of the foodie walkabout fest. But even with two more hours to go, a huge majority of the participating vendors were already posting premade signs that they were sold out. My friend John of Social Domain and I went from the Ludo Truck to Casa Linda to Tasting Kitchen and all were sold out, although we were told we could buy food, but they just didn’t have any more Taste portions to give out. Apparently the vendors were told by the Taste organizers to only reserve 150 bites to pass out for the event. Ludicrous considering ticket buyers were encouraged to buy packs of tasting tickets. By the time 5 o’clock rolled around, many folks were left with fistfuls of worthless tickets. The few bites that were still available, however, were so disappointing: a crostini with a gherkin from Joe’s Restaurant and the bacon-wrapped date at Primitivo. If I were someone new to these Venice restaurants and saw Taste as an opportunity to check things out, I’d be turned off. Other places like N’ice Cream and Abbot’s Pizza had long, glacier-slow lines. It just made me sad. I felt cheated. Sure, I didn’t have to pay for this event as I got a media comp but I told people how great it was and listed it as a weekend to-do. I felt like I lied to them. I was only glad that I didn’t do any giveaway for it like I did last year. In any case, I really hope that the organizers will learn from this year’s mistakes and use all the criticisms I’m sure they received to make it better next year. Nice try, offering a 30% discount at Susan Feniger’s Street to Taste goers, but the fact that it just means those disappointed masses will have to spend more money doesn?t make it much of an amends, does it? UPDATE 10/29/10: Inside Outside Community Arts is offering several discounts to those who attended the Taste of Abbot Kinney. Hit the jump for the list. * I was comped for both events. With the holidays quickly approaching, here?s something you can check off your list early: Holiday cards and a beautiful new family portrait for only $195! The Pod Photography is offering a discount Holiday Card Photo Session that includes a 30 minute session, 25 custom holiday cards and an online viewing gallery. With a hip new photo, lots of card designs, paper options and greetings to choose from, your holiday cards will be the envy of the holiday season! The Pod Photography is a fresh, modern portrait studio where candid and fun is in ? stuffy and posed is out! The Pod?s mission is to bring affordable, quality photos and a boutique experience to its clients. *30% off at Susan Feniger’s STREET for brunch, lunch or dinner Sunday through Thursday from now through November 30th: Present your proof of Taste receipt or any unused tickets to your server and receive 30% off your entire bill including drinks. Please note this cannot be combined with any other offer. 6 Responses to Who Did It Better: The Bruery's Black Tuesday vs. Taste of Abbot Kinney? I also interviewed the organizer in a follow-up post. One thing worth mentioning: Taste was a charity event, and all proceeds went to a nonprofit that provides arts education to at-risk kids. I’m not sure they can just refund money like a business would. They are also working on more discounts. I agree, it’s not a perfect solution, but at least they are responding to the criticism from people like you and me. Ah, good point. Will include the charity mention in the post. I just don’t understand why they went from something that worked well last year to such a flawed system. One thing worth mentioning: The entire event was for charity, and all proceeds went to fund arts education for at-risk LA kids. I’m not sure they can just refund money like a business would, and would we really want them to? I agree the restaurant discounts are not a perfect solution, but at least they are responding to criticism and trying to make amends. This charity got in over its head, and I think some blame needs to go to the for-profit organizer, perfect Success. That company should refund the charity anything it charged. Ooops, sorry for the double post. Don’t know how to delete. The Bruery event was awesome. I attended the first session and they definitely know how to handle events at this point. When I arrived in Placentia, there must have been 200 people in line, but almost everybody had a beer within 15 minutes of the opening bell. The lines stayed about 20-deep, but moved with ease and everybody seemed happy. With those beers, happiness is easy. “Fistfuls of worthless tickets,” a crostini with a gherkin” and “glacier-slow lines?” Glad I didn’t go to Taste of AK.